"I liked the LEGO®-washing link. I thought it was an interesting way to describe how molecules can form just by being around each other in the right conditions." "The 'Here is Today' timeline was supercool and interesting to learn a bit about, though still a little confusing." "Being able to actually see the 'Here is Today' timeline for the things that have taken place to create and maintain life on this planet, and looking just how long from the creation of the planet it took to develop humans." "The Drake equation, and how it could predict how much life is out in the universe." "The pessimistic view on the Drake equation because I believe there has to be life out there somewhere in our galaxy. I didn't clearly understand every part of the equation, but from what I deciphered, there has to be life." "The Drake equation is a little confusing for me because it’s just hard to put everything together in my opinion and know every detail of it." "The Drake equation, because how is that a provable equation, even just using statistics? Our sample population of just us is incredibly small." "The chemistry stuff was confusing because I hate chemistry." 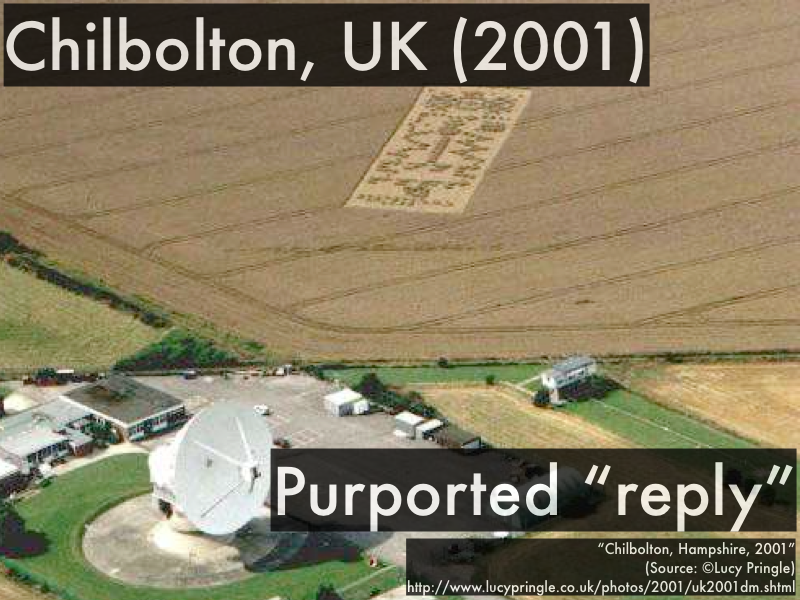 "The crop circles because I don't believe there are aliens doing that. But, they are so well drawn and made for no one to notice doesn't make much sense." "I was hella confused about everything!" "We can act on our own with our own thoughts." "A difference between living and non-living things is the idea that one takes an environment to live within and adapts to the environment to live within." "Living things are alive and need certain resources (like energy) to stay alive. Non-living things don't, and are dead without needing much." "Livings things grow and change. Non-living things stay the same or deteriorate over time." "Life is a living thing that should manipulate its environment, adapt to its environment, and store information/instructions (encode). Non-living things would do anything else not listed above." "One difference is reproduction, where something that is alive is able to reproduce and pass along its genetic material while a non-living thing cannot." "Life is long chain of molecules, while anything below that, such as a single molecule of molecular chemistry, is not considered life. Life can also be defined as one cell." "That way we can live on a new Earth since ours is most likely going to hell." "I think it's important to know if life can be possible somewhere else because we surely are killing this planet." "Earth will eventually die so we need to find a new place to live for future generations long into the future." "Because if we are alone in the entire universe, that would be truly frightening knowing that we could be the last of life." "The importance in being able in understanding there there may be life elsewhere opens up so many more ideas about how life is created and can give Earth a better idea on how the universe works or how to sustain the planet better." "I need to know if there's aliens, are there other lifeforms studying in our galaxy or another galaxy wondering if we exist?" "It's important for us to know what else is out there and learn about other living things that we are not familiar with. Life is life, and we should know or want to know about other living things." "I feel like it is important because You would want to know if there is something you are missing or something that may potentially kill you in the future. Its kind of like a scary horror movie." "It would give a lot of information about the start of life. It would allow us to further explore conditions required for life to start, and how probable it is for it occur in different conditions." "I would like to know because it could answer more questions about the universe and the other life's take on religion and how it all came to be. Also I love Star Wars and the thought of technologically advanced societies." "I would like tangible proof that life does exist out there in my lifetime." "I think it would be really fascinating to find out but it isn't like my life depends on it. " "It would take a long time to create life in a planet, so the bigger the star, the shorter the lifetime, giving the planet less time to form life within that solar system or planet." "It took life a long time to form on Earth and since a massive star has the shortest life time, life might not have enough time to form." "Based on life on Earth, a massive star would be too short-lived for life to form on a planet." "The Drake equation multiplies a number of factors that reflect more and more restrictive conditions for an advanced technological civilization to arise to calculate the number of these civilizations just in our galaxy, the Milky Way." 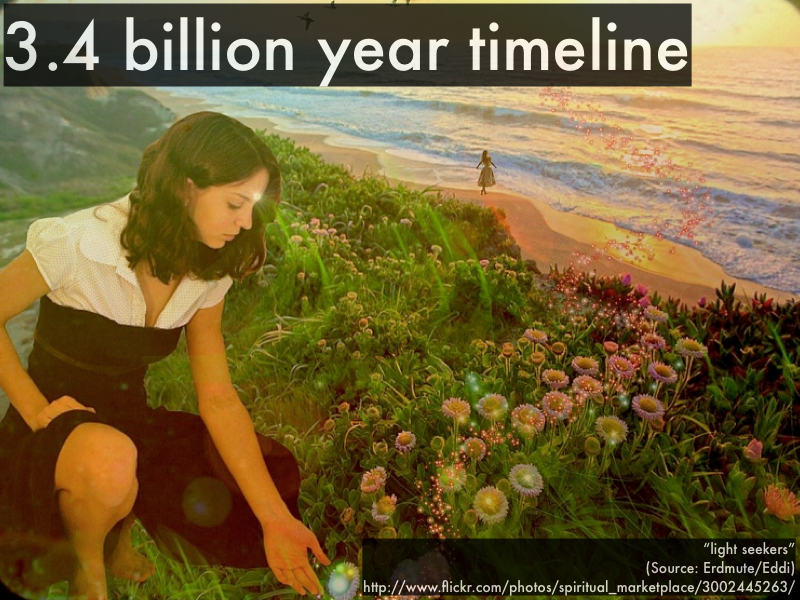 "I really liked how you posted the 'Here is Today' timeline on just how long it took to actually create life on Earth from the time it was created and how long it took to create the human race in regards to how long we have had life on this planet. It really helped to be able to put a lot of the ideas into action."